In 1968 10 Bay Area friends bought 20 acres of land surrounded by national forest high in California's Sierra Nevada range. The purpose was a sort of summer commune that would provide a future basis for our friendships, now that many of us were leaving for first jobs on the East Coast. It was a 'sixties-style gesture that in retrospect seems incredibly naive, especially my own fantasy that I would be able to exploit the academic schedule of my new career to effectively straddle the continent, have my East and my West. This particular rectangle of western wilderness becomes the object of a life-long—life-warping—romantic pre-occupation. Owning the Sierra Nevada turned out to be, at its deepest level, a story about the poignancy of not being able to be all places at once, the tragedy, if that's how you live it, of limits. Of mortality. I worried about the legitimacy issue. 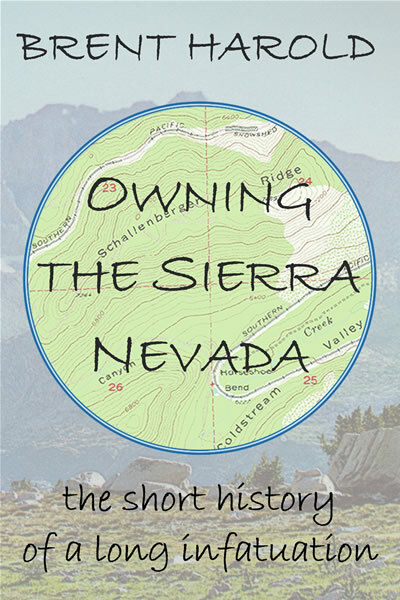 At some point early in the process of writing Owning the Sierra Nevada: the Short History of a Long Infatuation, a book about my connection to the Sierras, it hit me: How dare I write about this place where I am more or less a stranger, where I have spent less than six months spread over several decades? I live in a small resort town toward the tip of Cape Cod, as famous on this side of the continent as the Sierras are on that side. One of the little pleasures of fulltime life here is exercising a certain fond contempt for those who merely visit here, who love us for a weekend or couple of weeks in the summer and leave us. I write a regular newspaper column about issues of living on this peninsula. I know how I would feel if some mere tourist, some here-today-gone-tomorrow summer person were to presume to write a book about us. And wasn't that just what I was in the process of doing with our beloved piece of the Sierras? But then I remembered Henry Thoreau, who wrote the most famous book about Cape Cod based on a few walks he took here. And Henry Beston, who wrote the next most famous book, based on a scant year living on the beach. For that matter, the Thoreau of the Sierras is John Muir, and he was hardly a native or settled denizen of the mountains. So much for "write what you know," that oldest advice for writers. Seems there is a venerable tradition of writing what you don't know, or don't know well. It's may not be loyal wives of long-standing who inspire the best love poetry, but mistresses and fantasy women. And that is what the book turned out to be, a lovesong about a place I don't know well enough. "...an edgy West, the West of metaphor....a simple little book about decades of yearning." "A fascinating and compelling story, told with the same easy charm and intelligence that Harold brings to his newspaper columns...Lovely meditation on the implications of ownership...The result is a book that is both one person's story about one particular place, and a universal discourse on permanence and change. The tale is told so deftly that when you're done, you feel as if you've known its protagonist for years."